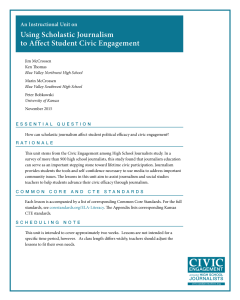 Using data from the survey, we developed a set of five lessons to assist journalism and social studies teachers advance their students’ civic efficacy through the principles of journalism. Click on this link or the graphic to the left to download a PDF containing the lessons. The unit begins with students considering what it means to be civically engaged, and identifying issues that matter to them and to their communities. Students then learn about the extent to which the First Amendment protects their speech. The unit culminates with students learning to write opinion columns that address the issues they identified earlier. The original survey on civic-media efficacy is available online for teachers to use as a pre- and post- assessment for this unit.